Occasionally in the discussion group, webmasters ask, "Should I be using Google Webmaster Tools or Google Analytics?" Our answer is: use both! Here are three scenarios that really highlight the power of both tools. One of my favorite features of Webmaster Tools is that it will show you the Top 20 search queries your site appeared for along with the Top 20 clicked queries. The data from the Top Search Queries allows you to quickly pinpoint what searches your site appears for and which of those searches are resulting in clicks. Let's look at last week's data for www.google.com/webmasters as an example. To something more readable such as "Use gadgets to easily add cool, dynamic content to your site..." by adding a meta description to the URL. And what are users doing when they visit your site? Are they browsing your content or bouncing off your site quickly? To find out, Google Analytics will calculate your site's "bounce rate," or the percentage of single-page visits (e.g. someone just visiting your homepage and then leaving). This can be a helpful measure of the quality of your site's landing page and the traffic your site receives. After all, once you've worked hard to get your users to visit your site, you want to keep them there! Check out the Analytics blog for further information about "bounce rate." Let's imagine you have a .com that you want to target at a Japanese market. Webmaster Tools allows you to set a geographic target for your site, where you would probably pick Japan. But, doing so is not an immediate solution. You can confirm the location of your visitors using the map overlay of Analytics, right up to the city level. You can also discover what types of users are accessing your site - including their browser and connection speed. If users cannot access your website due to an incompatible browser or slower connection speeds, you may need to rethink your website's design. Doing so can go a long way toward achieving the level of relevant traffic you would like. One day, you log into Analytics and look at your "Content by Title" data. You shockingly discover that users are visiting your /privatedata pages. Have no fear! Go into Webmaster Tools and use the URL removal tool to remove those pages from Google's search results. Modifying your robots.txt file will also block Googlebot from crawling that section of your site in the future. For more tips and tricks on Analytics, check out the Analytics Help Center. If you have any more suggestions, feel free to comment below or in our Webmaster Help Group. Setting up and running a website is getting easier and easier, and it's wonderful to see so many new webmasters sharing their voices with the world! For you as a webmaster it's pretty easy going... until you run into an issue that you just can't seem to solve on your own. Maybe some technical issues were flagged in your Webmaster Tools account; maybe you're just trying to get your robots.txt to block a certain part of your site; or maybe someone reported that they got a virus while visiting your site (gasp!). All of these issues can come up and sometimes it's helpful to have a helping hand when diagnosing and solving it. Our Google Webmaster Help Group is a great place to get help. There are many webmasters active in our group, friendly and ready to help others, often with first-hand experience. They can show you what might be wrong, show you how you can find answers in the future, and point you towards a solution that you'll be able to use. Just recently a webmaster came into the groups with a website that was having strange problems. Less than 20 minutes later, one of our dedicated members replied and pointed the webmaster to hidden content that was placed on their site by someone else. Finding that is bad enough; but not finding it is even more frustrating. While there are lots of helpful people in our groups, we have some that really stand out as being exceptionally active, helpful, competent and friendly. They volunteer time and energy to help build a great community and to help webmasters all around the world. In order to more publicly recognize their contributions, we're calling them our Bionic Posters. We want to highlight their outstanding efforts and thank them for the sound advice they've offered to so many. Thank you all for helping to make the Webmaster Help Group such a success! Come and visit the Webmaster Help Groups and see how you can make a difference as well. Be bionic! Local search: Help nearby searchers find your business. Video search: Enhance your video results. Several site owners asked whether they could specify a preferred thumbnail image for videos when they appear in search results. Good news: our Video Sitemaps protocol lets you suggest a thumbnail for each video. Personalization of search results is usually accomplished through subtle ranking changes, rather than a drastic rearrangement of results. You shouldn't worry about personalization radically altering your site's ranking for a particular query. Targeting a niche, or filling a very specific need, may be a good way to stand out in personalized results. For example, rather than creating a site about "music," you could create a site about the musical history of Haiti. Or about musicians who recorded with Elton John between 1969-1979. Some personalization is based on the geographic location of the searcher; for example, a user searching for [needle] in Seattle is more likely to get search results about the Space Needle than, say, a searcher in Florida. Take advantage of features like Local Business Center and geographic targeting to let us know whether your website is especially relevant to searchers in a particular location. As always, create interesting, unique and compelling content or tools. Image search: Increase your visibility. One panelist presented a case study in which a client's images were being filtered out of search results by SafeSearch because they had been classified as explicit. If you find yourself in this situation and believe your site should not be filtered by SafeSearch, use this contact form to let us know. Select the Report a problem > Inappropriate or irrelevant search results option and describe your situation. Feel free to leave a comment if you have other tips to share! Many people talk about the effect the Internet has on democratizing access to information, but as someone who has been visually impaired since my teenage years, I can certainly speak to the profound impact it has had on my life. In everyday life, things like a sheet of paper—and anything written on it—are completely inaccessible to a blind or visually impaired user. But with the Internet a new world has opened up for me and so many others. Thanks to modern technology like screen readers, web pages, books, and web applications are now at our fingertips. In order to help the visually impaired find the most relevant, useful information on the web, and as quickly as possible, we developed Accessible Search. Google Accessible Search identifies and prioritizes search results that are more easily used by blind and visually impaired users – that means pages that are clean and simple (think of the Google homepage!) and that can load without images. Why should you take the time to make your site more accessible? In addition to the service you'll be doing for the visually-impaired community, accessible sites are more easily crawled, which is a first step in your site's ability to appear in search results. So what can you do to make your sites more accessible? Well first of all, think simple. In its current version, Google Accessible Search looks at a number of signals by examining the HTML markup found on a web page. It tends to favor pages that degrade gracefully: pages with few visual distractions and that are likely to render well with images turned off. Flashing banners and dancing animals are probably the worst thing you could put on your site if you want its content to be read by an adaptive technology like a screen reader. Keep web pages easy to read, avoiding visual clutter and ensuring that the primary purpose of the web page is immediately accessible with full keyboard navigation. 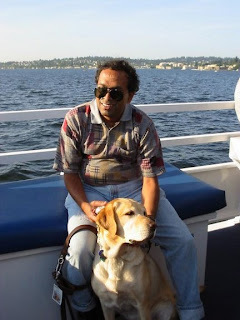 There are many organizations and online resources that offer website owners and authors guidance on how to make websites and pages more accessible for the blind and visually impaired. The W3C publishes numerous guidelines including Web Content Access Guidelines that are helpful for website owners and authors. As with regular search, the best thing you can do with respect to making your site rank highly is to create unique, compelling content. In fact, you can think of the Google crawler as the world's most influential blind user. The content that matters most to the Googlebot is the content that matters most to the blind user: good, quality text. It's also worth reviewing your content to see how accessible it is for other end users. For example, try browsing your site on a monochrome display or try using your site without a mouse. You may also consider your site's usability through a mobile device like a Blackberry or iPhone. Fellow webmasters, thanks for taking the time to better understand principles of accessibility. In my next post I'll talk about how to make sure that critical site features, like site navigation, are accessible. Until then! Our German Webmaster Central Blog celebrates its first birthday and we'd like to raise our glasses to 57 published posts in the last year! We enjoy looking back at an exciting first year of blogging and communicating with webmasters. It's the growing webmaster community that made this blog a success. Thanks to our readers for providing feedback on our blog posts and posting in the German Webmaster Help group. Over the past year, we published numerous articles specifically targeted for the German market - topics varying from affiliate programs to code snippets. We also translated many of the applicable English posts for the German blog. If you speak German (Hallo!) come check out the German Webmaster Blog and subscribe to our feed or email alert. Googlebot -- what a dreamboat. It's like he knows us <head>, <body>, and soul. He's probably not looking for anything exclusive; he sees billions of other sites (though we share our data with other bots as well :), but tonight we'll really get to know each other as website and crawler. Website: Those headers are so flashy! Would you crawl with the same headers if my site were in the U.S., Asia or Europe? Do you ever use different headers? Wireless fetches often have carrier-specific user agents, whereas Google Reader RSS fetches include extra info such as number of subscribers. I usually avoid cookies (so no "Cookie:" header) since I don't want the content affected too much by session-specific info. And, if a server uses a session id in a dynamic URL rather than a cookie, I can usually figure this out, so that I don't end up crawling your same page a million times with a million different session ids. Website: I'm very complex. I have many file types. Your headers say "Accept: */*". Do you index all URLs or are certain file extensions automatically filtered? Googlebot: That depends on what I'm looking for. If I'm indexing for regular web search, and I see links to MP3s and videos, I probably won't download those. Similarly, if I see a JPG, I will treat it differently than an HTML or PDF link. For instance, JPG is much less likely to change frequently than HTML, so I will check the JPG for changes less often to save bandwidth. Meanwhile, if I'm looking for links as Google Scholar, I'm going to be far more interested in the PDF article than the JPG file. Downloading doodles (like JPGs) and videos of skateboarding dogs is distracting for a scholar—do you agree? Website: Yes, they can be distracting. I'm in awe of your dedication. I love doodles (JPGs) and find them hard to resist. Googlebot: Me, too; I'm not always so scholarly. When I crawl for image search, I'm very interested in JPGs. And for news, I'm mostly looking at HTML and nearby images. There are also plenty of extensions (exe, dll, zip, dmg...), that tend to be big and less useful for a search engine. Website: If you saw my URL, http://www.example.com/page1.LOL111, would you (whimper whimper) reject it just because it contains an unknown file extension? Googlebot: Website, let me give a bit more background. After actually downloading a file, I use the Content-Type header to check whether it really is HTML, an image, text, or something else. If it's a special data type like a PDF file, Word document, or Excel spreadsheet, I'll make sure it's in the valid format and extract the text content. Maybe it has a virus; you never know. If the document or data type is really garbled, there's usually not much to do besides discard the content. So, if I'm crawling http://www.example.com/page1.LOL111 with an unknown file extension, it's likely that I would start to download it. If I can't figure out the content type from the header, or it's a format that we don't index (e.g. mp3), then it'll be put aside. Otherwise, we proceed indexing the file. Can you explain these headers to me? Googlebot: Sure. All major search engines and web browsers support gzip compression for content to save bandwidth. Other entries that you might see here include "x-gzip" (the same as "gzip"), "deflate" (which we also support), and "identity" (none). Website: Can you talk more about file compression and "Accept-Encoding: gzip,deflate"? Many of my URLs consist of big Flash files and stunning images, not just HTML. Would it help you to crawl faster if I compressed my larger files? Googlebot: There's not a simple answer to this question. First of all, many file formats, such as swf (Flash), jpg, png, gif, and pdf are already compressed (there are also specialized Flash optimizers). Website: Perhaps I've been compressing my Flash files and I didn't even know? I'm obviously very efficient. Googlebot: Both Apache and IIS have options to enable gzip and deflate compression, though there's a CPU cost involved for the bandwidth saved. Typically, it's only enabled for easily compressible text HTML/CSS/PHP content. And it only gets used if the user's browser or I (a search engine crawler) allow it. Personally, I prefer "gzip" over "deflate". Gzip is a slightly more robust encoding — there is consistently a checksum and a full header, giving me less guess-work than with deflate. Otherwise they're very similar compression algorithms. If you have some spare CPU on your servers, it might be worth experimenting with compression (links: Apache, IIS). But, if you're serving dynamic content and your servers are already heavily CPU loaded, you might want to hold off. Website: Great information. I'm really glad you came tonight — thank goodness my robots.txt allowed it. That file can be like an over-protective parent! The problem with the above robots.txt file-swapping is that once I see the restrictive robots.txt, I may have to start throwing away content I've already crawled in the index. And then I have to recrawl a lot of content once I'm allowed to hit the site again. At least a 503 response code would've been temporary. I typically only re-check robots.txt once a day (otherwise on many virtual hosting sites, I'd be spending a large fraction of my fetches just getting robots.txt, and no date wants to "meet the parents" that often). For webmasters, trying to control crawl rate through robots.txt swapping usually backfires. It's better to set the rate to "slower" in Webmaster Tools. Googlebot: Website, thanks for all of your questions, you've been wonderful, but I'm going to have to say "FIN, my love."